A. G. Spalding & Bros., Chicago, IL. Spalding, A Safe Decision Catalogue No. 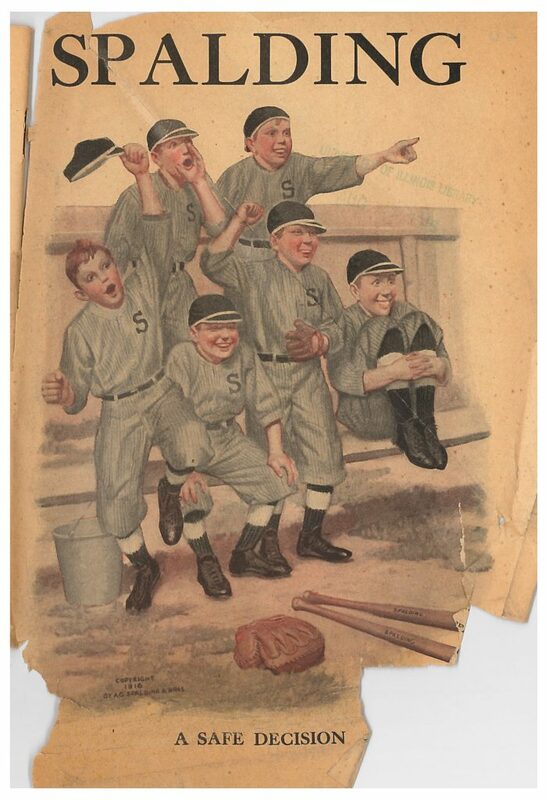 1610, 1916, front cover of catalog showing a baseball team. The beginnings of the sport of baseball can be traced back to Massachusetts in the late eighteenth century, but more regulated practices started in the mid-nineteenth century. With the development of official rules for the game and the founding of teams and leagues, baseball began to take off as a spectator sport, becoming a popular pastime for many Americans. 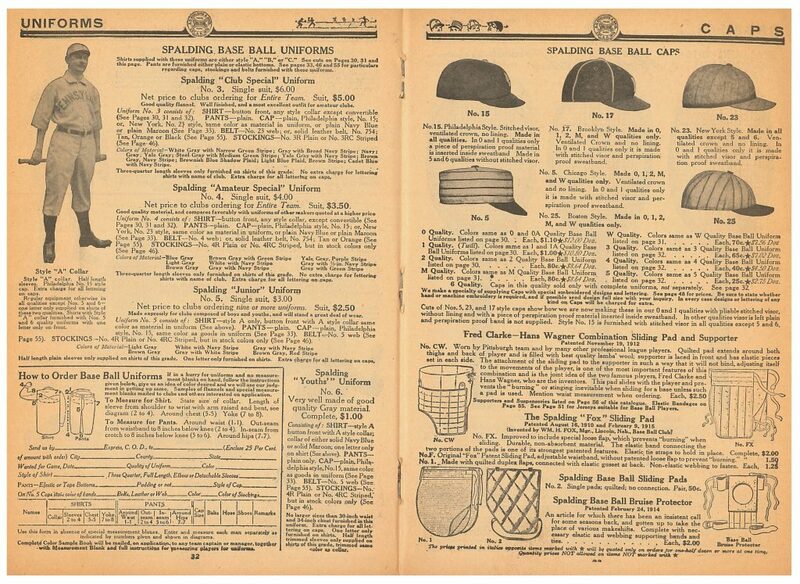 Since Albert Spalding was a baseball executive, his company, A. G. Spalding & Bros., geared baseball equipment mostly to American consumers starting in 1876. 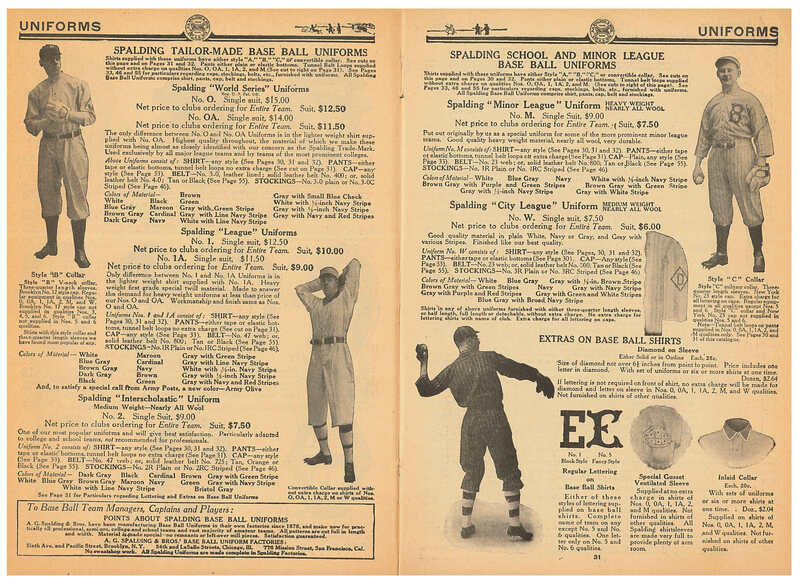 At the time this catalog was printed in 1916, the Spalding National League Ball was the only ball used in championship games. The manufacturing process used a cork core, which was patented in 1909. A. G. Spalding & Bros., Chicago, IL. Spalding, A Safe Decision Catalogue No. 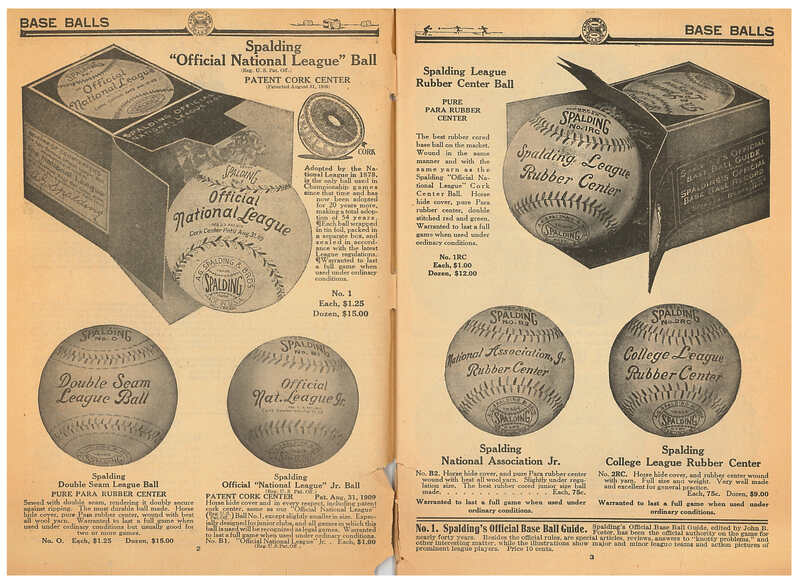 1610, 1916, pages 2-3, baseballs. 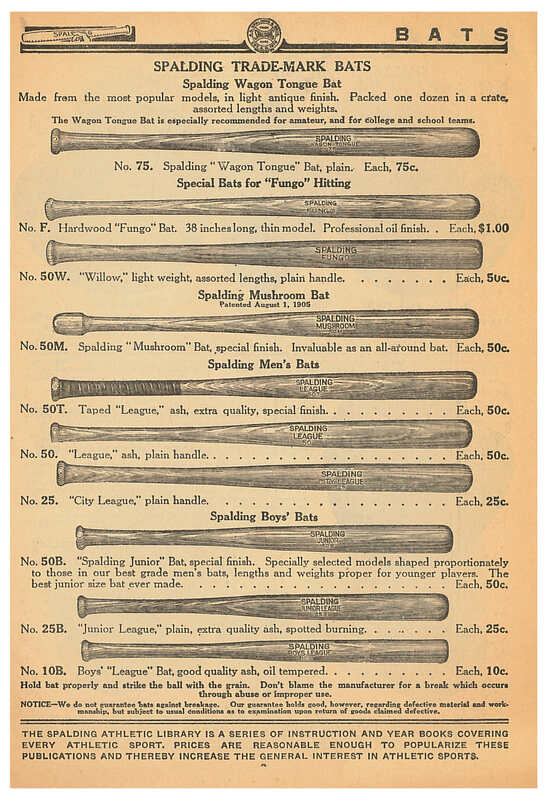 Spalding offered an assortment of trademark bats that were priced from 10 cents to $1.00, making it affordable to get one or more bats for aspiring players. Autograph bats from a select few players on the National and American League teams were available for sale at $1.00 each in 1916. Today, baseball memorabilia is its own industry and typically is a lot more expensive. A. G. Spalding & Bros., Chicago, IL. Spalding, A Safe Decision Catalogue No. 1610, 1916, page 9, baseball bats. 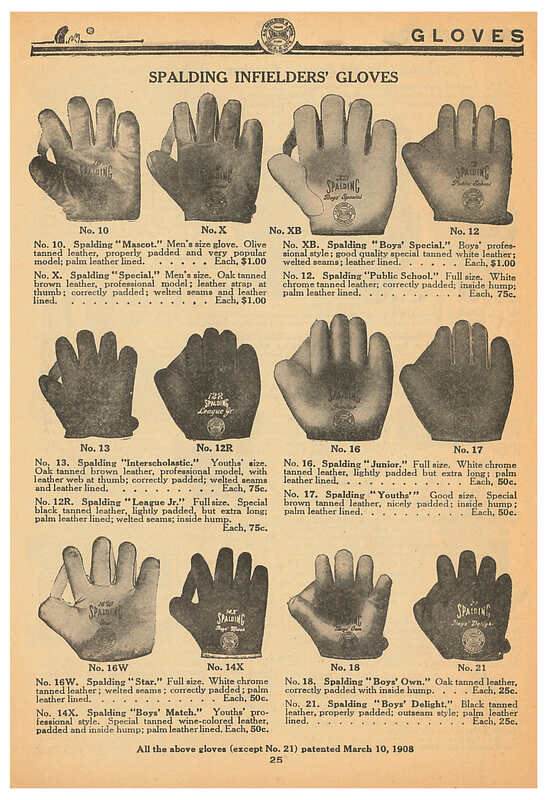 Gloves and mitts for left and right handed players were also offered in a variety of styles and sizes. These provide protection when players are catching flying balls to get the other team out. You can keep your own glove “handy” in case any fly balls head into the stands. A. G. Spalding & Bros., Chicago, IL. Spalding, A Safe Decision Catalogue No. 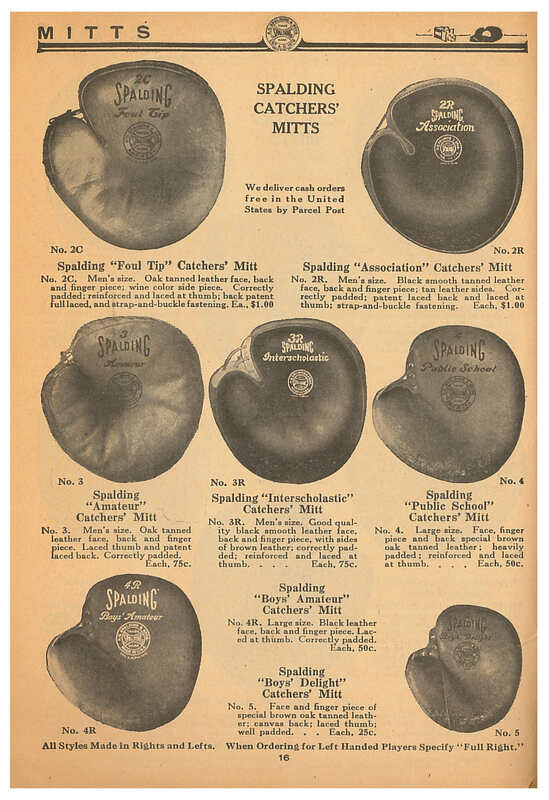 1610, 1916, page 16, catchers’ mitts. A. G. Spalding & Bros., Chicago, IL. Spalding, A Safe Decision Catalogue No. 1610, 1916, page 25, infielders’ gloves. In 1916, Spalding offered players of various ages several different styles of uniforms. Each uniform was custom made based on the buyer’s sizing specifications which would be mailed into the company. For some styles, there was no extra charge for the name of the team to be lettered on the shirt, but there was an extra fee for lettering on the caps. Spalding offered several different styles of caps based on national teams including Philadelphia, Brooklyn, New York, Chicago, and Boston styles. A. G. Spalding & Bros., Chicago, IL. Spalding, A Safe Decision Catalogue No. 1610, 1916, pages 30-31, baseball uniforms. A. G. Spalding & Bros., Chicago, IL. Spalding, A Safe Decision Catalogue No. 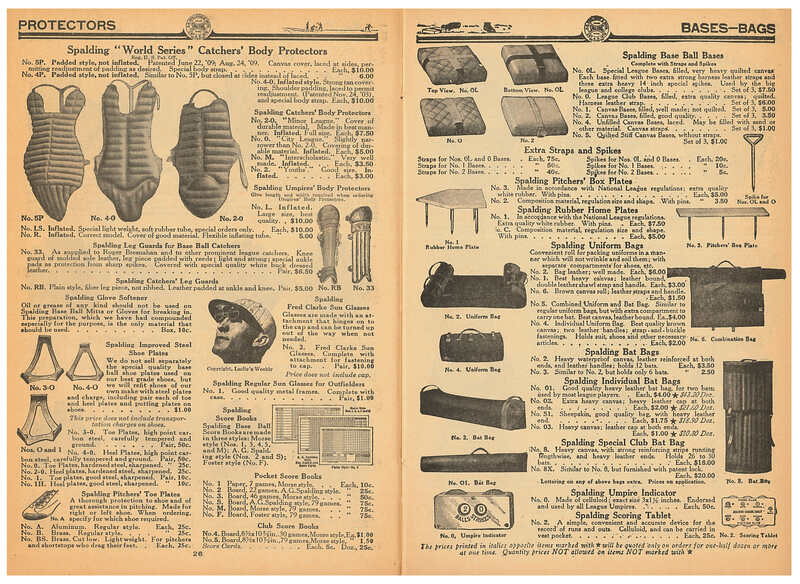 1610, 1916, pages 32-33, baseball uniforms and caps, baseball sliding pads, and baseball bruise protector. Since the game of the early twentieth century was considered pretty rough, players wore pads, like those shown above, for sliding and bruise protection to remain free from injury. Catchers and umpires had to be more protected, wearing face masks and front body protectors, as shown below, to prevent any stray balls from hurting them. A. G. Spalding & Bros., Chicago, IL. Spalding, A Safe Decision Catalogue No. 1610, 1916, pages 26-27, catchers’ body protectors and other baseball equipment. A. G. Spalding & Bros., Chicago, IL. Spalding, A Safe Decision Catalogue No. 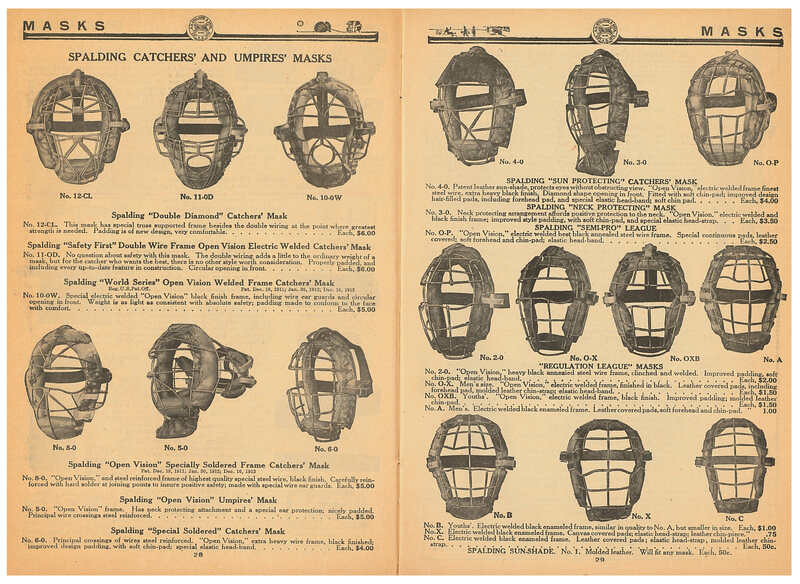 1610, 1916, pages 28-29, catchers’ and umpires’ masks. Since the sport’s beginnings in the late eighteenth century, baseball has gone on to become an important aspect of American culture. Hopefully seeing this early twentieth century baseball equipment will inspire Americans to catch a local game this season to root on their home team. Thanks to Emily Daniel (a Smithsonian-Mason History of Decorative Arts graduate student and 2015-2016 Graduate Research Assistant at the National Museum of American History Library) for her contributions to this post! Baseball-reference.com. History of baseball in the United States. Wikipedia. History of Baseball in the United States. Science Channel. How It’s Made-Baseballs. It’s amazing that there are some Hall of Famer players from that era. That equipment doesn’t look like it would help the players of today, except for maybe Little Leaguers. Hey Great post , Thanks For Your Post It’s amazing.